For today's menswear Monday post, I thought it was a good idea to link it in with the start of Wimbledon which despite the rain is still going strong as I type. 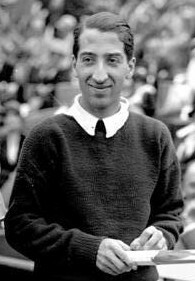 I was originally thinking of writing the generic "What to wear to Wimbledon" but a thought suddenly struck me that René Lacoste would be a much better subject for today's discussion. Born in 1904 in France, he rose to fame as a tennis player playing in many and winning 7 grand slams in the French championships, US championships and of course, Wimbledon. He was such a figure in the world of tennis that he was awarded the title "number one player in the world" in the years 1926 and 1927. It was from tennis that the iconic crocodile logo became to be a signature on all his tennis shirts. He was nicknamed "the crocodile" by his fans due to his tenacity on the court. In 1933, Lacoste along with Andre Gillier (clothing company) founded the La Société Chemise Lacoste which produce the iconic tennis shirts with the (alligator) crocodile logo. Lacoste was often seen on court wearing the shirts. He caused a huge sensation with these shirts and soon everybody wanted to sport one. However, there has been a lot of controversy about whether the logo is in fact a crocodile but actually an alligator. The story comes down to a bet he made with a team captain to see if he would win the game or not. The stakes were in fact an alligator skin suitcase that Lacoste had seen in a shop window. It was from then onwards that he was associated with the symbol of an alligator/crocodile. The idea that the logo is in reality an alligator was reinforced by an advertising campaign that pictured the iconic logo along with the phrase "See you later..." emphasizing the fact that it is indeed an alligator.